Ubisoft has revealed what to expect from Rainbow Six Siege’s next update, which will focus mostly on Operator balancing. 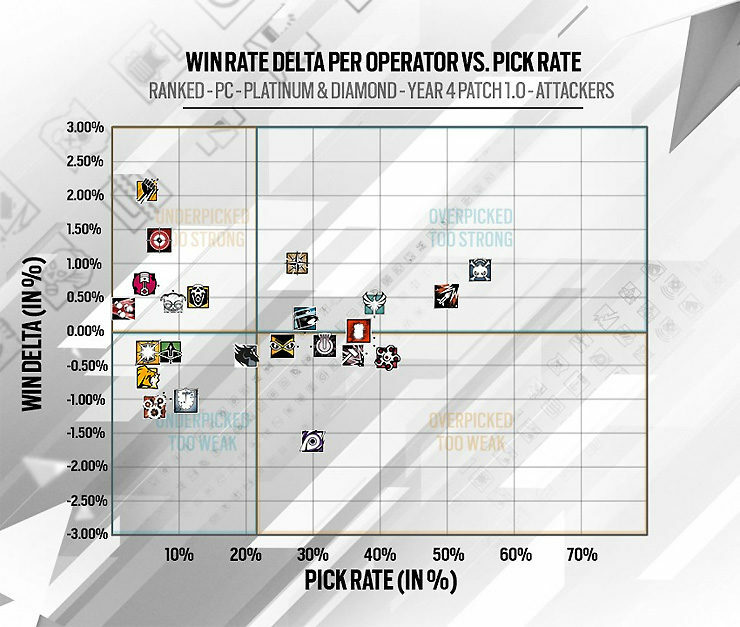 Interestingly, they also released detailed charts revealing which Operators are strongest and weakest based on their win percentage and how often they’re picked. Where do your favorites land on the chart? Check ‘em out below. 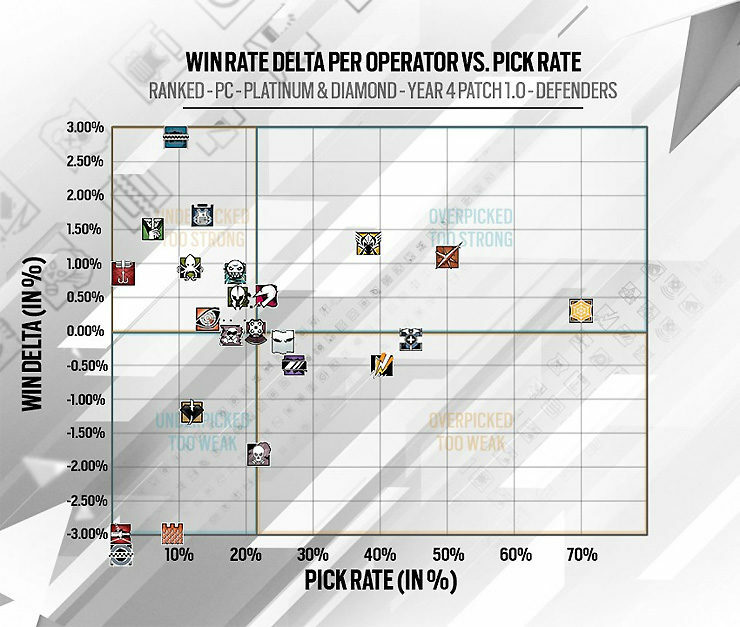 As for the Operator tweaks, it looks like Lion’s scanning ability is getting nerfed in a pretty major way, Capitao is being returned to his original area denial role, and Nomad’s Airjab launcher is being toned down again. Get a full rundown of all the coming changes, below. The total duration of Lion’s ability is shorter for both the warning and the scanning phases. The scan will last a total of 3.5 seconds (from 7 seconds). To balance things, we have increased the number of uses to 3 and also reduced the ability cool-down. We want to shift Capitao back to his original intention, which is that of an area denial Operator. This is possible by making further iterations on an improved propagation system that will make the area of effect no longer go through objects. Additionally, based on feedback from the initial Test Server phase, we have adjusted the amount of time it takes to expand to the full area of effect. This will allow players time to react to the deployment of his Asphyxiating bolts. In response to feedback about Airjabs being too difficult to counter, we added an idle sound following the gadget deployment. Our goal is to reward cautious players to spot nearby Airjabs and to adapt appropriately. 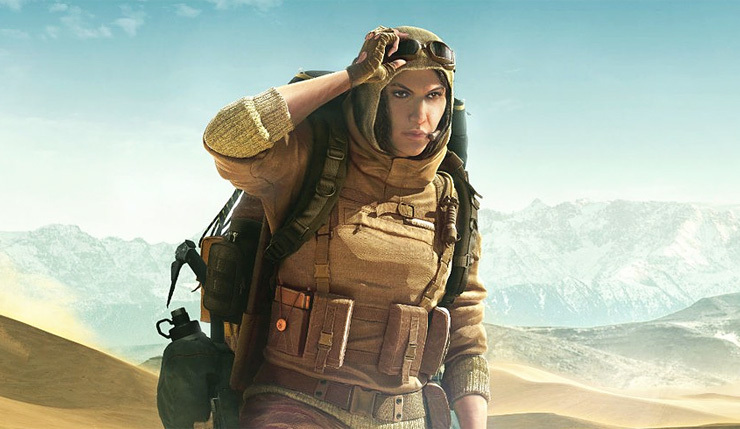 Thanks to her Airjabs, Nomad already had three gadgets designed to counter flanking by the defending team. That is why we decided to give her stun grenades instead. By reducing the amount of slugs, we want players to choose between destroying soft walls to prepare their defence and using the weapon to repel attackers. Increasing the damage of the AUG-A3 should make it a more viable choice for Kaid mains. Rainbow Six Siege is available on PC, Xbox One, and PS4. We don’t have a release date for the game’s next patch yet, but expect it within the next couple weeks.